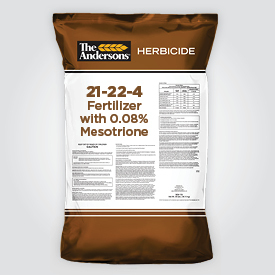 21-22-4 Fertilizer with Mesotrione is a homogeneous starter fertilizer granule impregnated with Mesotrione herbicide. This unique combination is ideal for use during turf establishment, renovation or overseeding to control weeds while providing a high-quality starter fertilizer to promote seedling germination and rapid establishment. As a 135 SGN granule, this product provides enhanced coverage and a more uniform application of both fertilizer and herbicide, resulting in superior performance.